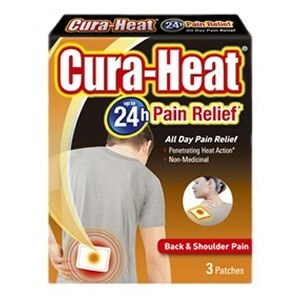 Cura-Heat Up to 24h Back & Shoulder Pain Relief with penetrating heat action, lasts for 12 hour and once removed the pain relief can continue for a further 12 hours, resulting in up to 24 hours pain relief. Just open the sachet and apply to clothing/underwear where the heat radiates through to the source of pain - increasing circulation, decreasing stiffness and relaxing sore muscles. Fragrance free, non-medicinal and with a thin discreet design, they are ideal to use anywhere. Open the sachet by hand (do not cut) and remove the Cura-Heat heat pack.Peel away the paper strip and adhere to clothing/underwear over the painful area.Cura-Heat will warm up gradually and reaches maximum heat within approximately 30 minutes.After use slowly peel off the heat patch and then dispose with normal household waste. For external use only. Cura-Heat is air-activated - do not open the sachet until you are ready to use it.Never apply the heat packs directly to the skin. Thank you for your interest in Cura-Heat Up to 24h Back & Shoulder Pain Relief. Enter your email and we'll contact you as soon as it's available again.